FQC Certification is an independent certification & training body established to help organizations achieve excellence and world class competitiveness through the application of various International Standards. Our main objective is making you a corporate of international stature and your products & services a globally accepted entity. FQC propose to offer its value added, efficient & cost effective certification and trainings services to all the sectors including Government, Public and Private. It is a professional organization backed by devoted, highly qualified and experienced personnel. Regular assessment performed by FQC helps you to continually use, monitor and improve your management system and processes. This improves the reliability of your internal operations to meet customer requirements, as well as overall performance. You will also most likely gain a significant improvement in staff motivation, commitment and an understanding of their responsibility. 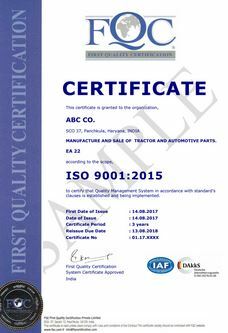 FQC certification services are accredited by German accreditation board “DAkkS” for very wide range of scope. Its auditor trainings services are accredited by International Registrar of Certified Auditors (IRCA) UK. Personnel employed by FQC are highly qualified and experienced and selected against competence criteria established as per International norms. They are people from diversified sectors having considerable experience of working in Industry. This means assessor who visits you very well know about your Industry.